The awareness of being an installation/artwork and the desire to act/move in various ways out of the frame/rules appears clear in a photo/self-portrait of 1997. I pose next to “Totem II” and “…comme un oiseau” is in the background. The two works were just finished, on the memory of a New York visit of my daughter and I for her 15th birthday. 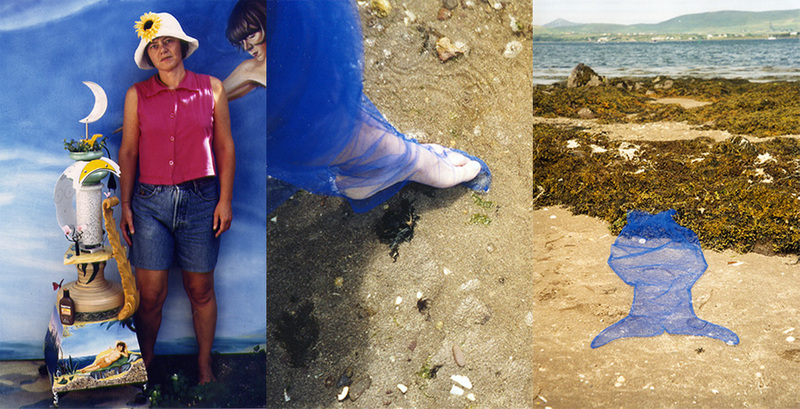 At that time I did not know what the performance art was and I was still unaware of it a few years later in 2003, during my first visiting artist residency in Ireland, at Cill Rialaig. Though, on the beach of Dingle, while playing with the tulle SHirEn and dolpHEn flukes-appendices I had made in Italy, I could clearly feel the dolphin Fungie breathe (even if he perhaps was miles away). I clearly sensed my acts as a serious game. What I was doing was important and meaningful, regardless an object or a photo produced. In that precise moment I realized that painting was not enough. I wanted to go further, searching for the freedom to practice an art that changes and makes you change, urged by the intimacy and the facts of the ordinary life that everybody recognize as universal values. Alone or with the right company. This proceeding in the ephemeral that counts/remains can appear rambling or ineffective at first glance, but ‘this is my way': the very important things/acts are always recorded by heART and take beautiful shapes at the right time.